This artist’s impression shows the formation of a gas giant planet in the ring of dust around the young star HD 100546. This system is also suspected to contain another large planet orbiting closer to the star. The newly-discovered object lies about 70 times further from its star than the Earth does from the Sun. 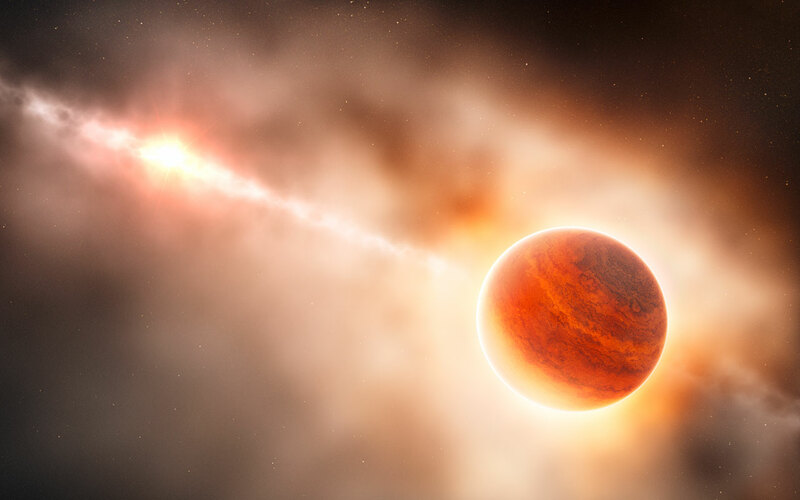 This protoplanet is surrounded by a thick cloud of material so that, seen from this position, its star almost invisible and red in colour because of the scattering of light from the dust. 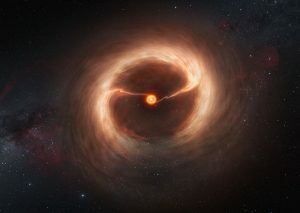 Astronomers have captured the first ever confirmed image of a newborn planet forming around a young dwarf star-an ambitious task that has previously proved elusive to scientists. The brightness of the planet has been measured at different wavelengths by the astronomers to get detailed information about the properties of the planet. It is located around 3 billion kilometres away from the star. This is the rough equivalent to the distance between them Uranus and the sun. The ESO’s Very Large Telescope (VLT) in Chile captured the first confirmed image of a newborn planet around the star PDS 70. The stunning snapshot, considered the first robust detection of a young planet, was captured by the SPHERE instrument on the ESO’s. A team led by astronomers from the Max Planck Institute for Astronomy in Heidelberg, Germany, used the VLT’s Planet-spotting sphere instrument to locate and snap a portrait of the cosmic baby. Elusive red sprites captured in sky hear Achille’s Very Large Telescope. The planet is called PDS 70b and scientists have determined it is a gas giant with mass several times that of Jupiter. But don’t pack your suitcase for a visit just yet. It has a surface temperature of around 1,800 degrees Fahrenheit (1,000 degrees Celsius) and takes 120 years to orbit its host star. PDS 70b is a wee babe of a planet and astronomers believe it is likely still growing. “The theoretical provides us with an unprecedented opportunity to test theoretical models of planet formation,” said Andre Muller, a member of the research team. The team’s results will appear in the Journal Astronomy and Astrophysics. There is a dark region at the centre of the image, which is there because of a coronagraph. It is a mask blocking the blinding light of the star in the centre. It would not have been possible to get the photograph in the current form without the mask. Miriam Kepler of the Max Planck Institute for Astronomy in Germany said hints of baby planets have been detected before, but astronomers weren’t sure whether those observations might simply be features in the swirling dust. In a paper to be published in astronomy $ astrophysics, scientists describe the planet, located about three billion km from the star PDS 70, as a gas giant bigger. The team comprises several members of the original team, including Keppler. “These discs around young stars are the birthplaces of planets, but so far only a handful of observations have detected hints of the baby planet in them,” Miriam Keppler, lead researcher from the Max Planck Institute for Astronomy. According to the news, the finding would not have been possible without SPHERE instrument, which uses the technology of high contrast imaging. Scientists hope the detection will offer greater insight into the early stages of planetary evaluation and enhance their overall understanding of alien worlds.